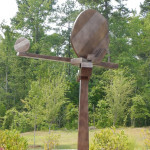 Carolina Bronze recently fabricated a sheet aluminum sculpture for artist and owner, Ed Walker. The piece titled “Balancing Time”. 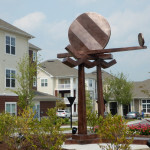 was installed at the REALM Patterson Place Apartments in Durham, NC for the Bainbridge Companies. 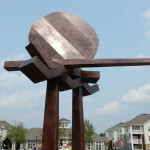 Once the metal was cut, the sculpture was welded together, with structural supports added inside. Stains were added to the surface to color the metal. 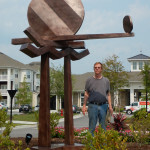 This is a great way to get the look of a bronze sculpture without the expense.